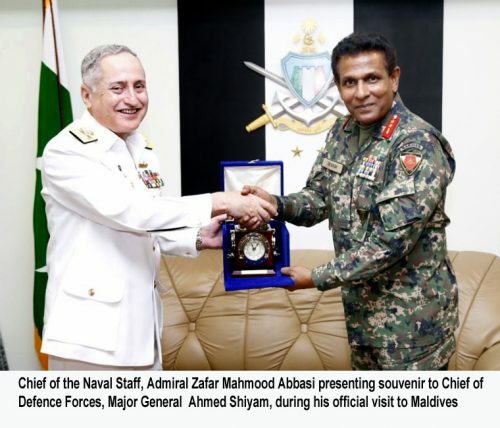 ISLAMABAD (92 News) – While on official visit to Maldives, Chief of the Naval Staff Admiral Zafar Mahmood Abbasi called on President of the Republic of Maldives Abdulla Yameen Abdul Garoom at President’s office at Male on Monday. During the meeting, matters of mutual interests were dilated upon. Admiral Zafar Mahmood Abbasi highlighted Pakistan’s commitment and performance in fight against terrorism, including Pakistan Navy’s contributions, towards regional maritime security, in pursuance of the Pakistan government policies, to ensure peace and stability in the Indian Ocean Region. 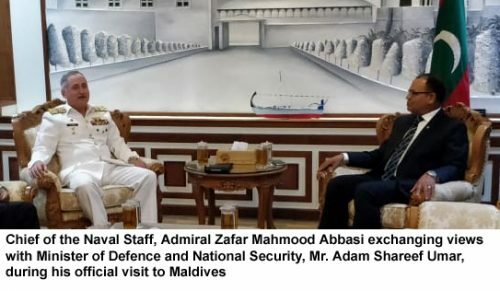 The Maldives president acknowledged Pakistan Navy’s strenuous efforts for maintaining maritime security in the region and thanked Chief of the Naval Staff for gifting of a Landing Craft Mechanized. The president also expressed satisfaction over the historical bonds and defence collaboration between Pakistan and Maldives in various avenues, including training, reciprocal visits, port calls and looked forward to further increase in defence ties and bilateral relations. The Admiral reiterated Pakistan’s continued support to Maldives Armed Forces in the field of training, provision of equipment, technical manpower and expertise. Earlier, Chief of the Naval Staff met Minister of Defence and National Security, Adam Shareef Umar and Chief of Defence Forces, Major General Ahmed Shiyam. Upon arrival at Maldives National Defence Forces Headquarters, a smartly turned out contingent of Maldives armed forces presented him the guard of honour. During the meetings, discussions on professional matters including bilateral defence collaboration and security environment in Indian Ocean Region were held. Various avenues of cooperation between the two Navies were also focused. Pakistan and Maldives enjoy cordial relations founded on the common principles of brotherhood, friendship and sovereign equality. Being littoral states of Indian Ocean Region, both countries share common maritime challenges. As an extension of Government’s foreign policy, Pakistan Navy continues proactive endeavors to enhance maritime collaboration with the Indian Ocean littoral states. It is expected that recent visit of Naval Chief will enhance collaboration between the two countries in general and navies in particular in the diverse defence related avenues.